The KYDEX® Sheath Making Kit is a great way to go when you're making your own custom knife sheath, gun holster or other carry system. This kit contains everything you need to make a top quality KYDEX® sheath (like the one shown) for your knife, gun, flashlight or other item. 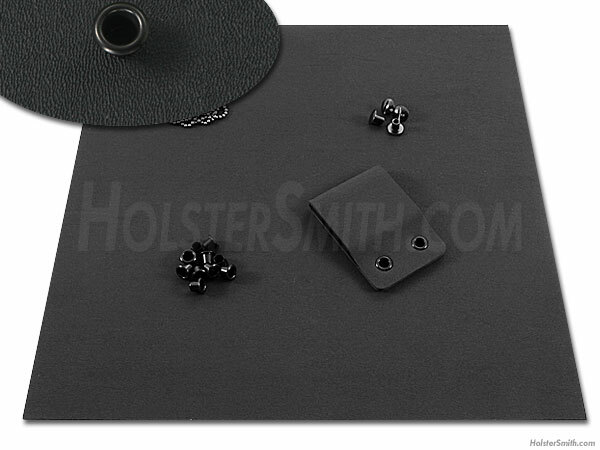 We supply a 12x12 square of .093 gauge cell/smooth finish KYDEX® material, (1) 20lb pull ball chain, (10) 8-9 black rivets and (1) custom vertical/horizontal universal pre-formed belt loop with mounting fasteners. (1) 12x12 piece of .093 KYDEX® material (cell/smooth finish). (1) Ball chain 20 lb pull (breaking strength) This chain is common on neck style knives. (10) #8 - 9 black rivets. Requires a .25 inch hole in the sheath for fastening. ** Belt loops shown have been modified with 4 point mount. Supplied loop is undrilled in mounting area to allow perfect mounting to most all designs.